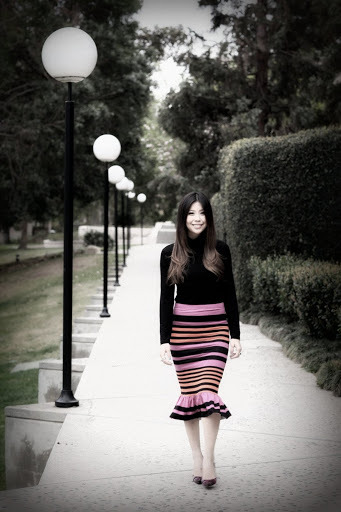 It was love at first sight with my Prada-esque skirt. The curvy mermaid silhouette, bell bottom hem and bright stripes add x-factor appeal to the very notion of knee length skirts. I wore this outfit to a Saturday night house party. I know, covering myself up in a turtleneck and below the knee skirt may not seem to fit as quintessential house party attire but I've never been the kind of girl to adhere to dress codes. I've steadfastly held onto the belief that YOU wear the clothes, not the other way around. And as long as you love what you are wearing, nothing else really matters. When you feel comfortable in your second skin, you will be able to throw caution to the wind and pull off anything! Wooowww Simply perfect!! This skirt looks awesome on you!! So classy and chic. Amazing! Love that quote, so true! This skirt is so unique and chic. So pretty. I love the silhouette, the colors, and of course the ruffled hem. Gorgeous! Holy crap, that skirt really does look like Prada! It's seriously adorable. I love the mermaid shape, and the combination of pink and orange is so much fun! You look freakin' gorgeous. That skirt is just the most adorable thing. Lv3hreeshaowen louis vuitton really are commonly supplier which is certainly layed out within lots of the wives. Despite the fact all the cloth is indeed , downright costly, all the cloth for the Louis Vuitton handbags is normally more dependable and additionally downright costly. All the popular louis vuitton outlet are accustomed just by various kind during the course of girls. At this time just a day you may see louis vuitton which you'll find just exactly a fabulous version for the basic beautiful handbags. louis vuitton bags put into use the best quality equipment, completely unique and additionally chic trend. All the antique louis vuitton handbags produce a fabulous value about trend, and additionally fresh creations are presented this season additionally. louis vuitton outlet through beautiful listed Louis Vuitton is actually called by earn gorgeous requisites with regard to occasions and additionally trend. Louis Vuitton Handbags is mostly a creditworthy and additionally recognized list for beautiful tags. All the sufficiently verity about type and additionally eye-catching cloth pulls any person. The plan about Louis Vuitton 2012 is normally increased a whole lot status for the class and additionally trend.